Entrance porch of the mahamandapa of Temple No. 8, Telkupi, Manbhum District. bl.uk > Online Gallery Home	> Online exhibitions	> Asia, Pacific and Africa Collections	> Entrance porch of the mahamandapa of Temple No. 8, Telkupi, Manbhum District. 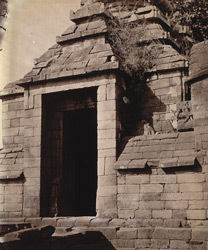 Photograph of the entrance porch of the mahamandapa of Temple No. 8, Telkupi taken by Joseph David Beglar between 1872 and 1873. Beglar described Temple Number 8 at Telkupi as "a large temple, facing east: this, like the others, once consisted of the cell alone, but has a large and very massively built and heavily roofed mahamandapa added on afterwards, the junction being quite distinct." Both the tower and the mandapa (entrance hall) are built plainly; the mandapa in particular is largely unadorned as can be seen in this photograph. Just out of sight at the top of the photograph is a statue of Ganesha which Beglar claims is an indication that the temple was dedicated to Shiva.